Obama is akin to Jim Jones serving Kool-Aid to gullible followers in Jonestown. Despite the negative tone, Clinton's attacks are working with the media, which are reacting to charges that they have gone easy on Obama. Seems that it is time for a change in the story line that Obama is the new, new thing, a gifted speaker who gains votes the more people see him. And since it's the nature of the press to have severe morning-after regret for having gotten a lump in the throat over a candidate, you have a definite backlash that may help Clinton win the next big races: Ohio and Texas. Now critics are quietly voicing the fear that Mr Obama and his campaign have deliberately adopted the tone and tactics of an evangelical preacher, whipping up “Obamamania” at the expense of more serious discussion of policy and government. There is “something just a wee bit creepy about the mass messianism” deployed by the black senator and his supporters, observed Joe Klein, the veteran political commentator the first to latch on to the political potency of Bill Clinton, then an obscure Arkansas governor, early in the 1992 White House campaign. At no fewer than six of Mr Obama’s recent rallies, young enthusiasts have been so overcome with excitement that they have fainted in front of the stage. 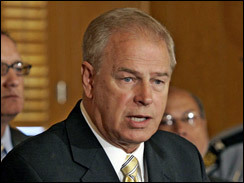 Political Players: Ted Strickland Defends His Candidate, Predicts Wins in Ohio, Texas and Pennsylvania.